It's easy to tell time the smarter way with Q. This watch features a black IP case, and leather strap for everyday style. This hybrid smartwatch communicates with your phone giving it notifications on email, alarms and helps you organise your day. Other functions this timepiece boast are being able to press the shutter and take a photo on your smartphone, control your music, track both your steps and your sleep with a built-in fitness tracker. A subdial on the watch helps you track the day easier. Wear it to have all of the benefits of a smartwatch with the traditional style of classic watches. 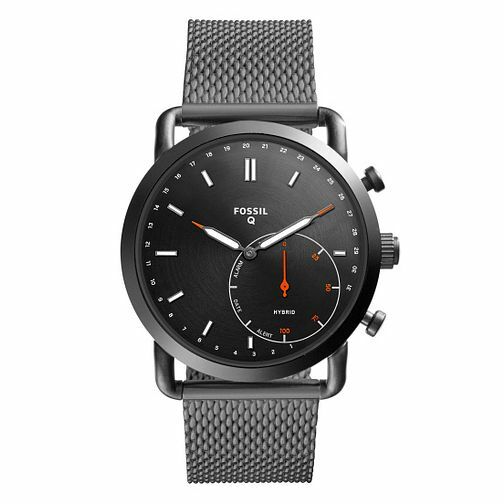 Fossil Q Smartwatches bring a minimalist style to cutting-edge technology.